Nottingham Business School welcomed colleagues from partner institutions around the world to as part of Global Responsibility Week. Global Responsibility Week commenced with an introduction to mindfulness delivered by Lúcia Barros Gurney from ESPM, Brazil. 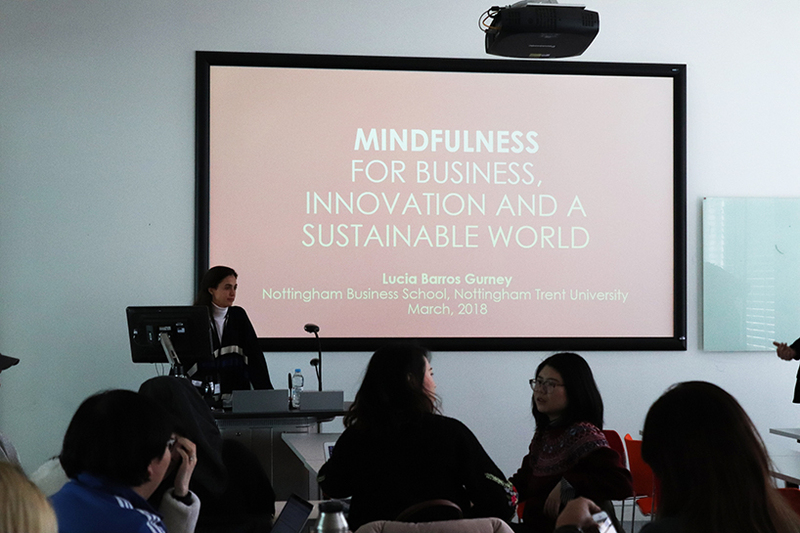 Students were introduced to the scientific point of view of mindfulness, with explanations of how it can be applied to businesses and innovation in order to help create a sustainable society. Lúcia explained that the benefits of mindfulness have been proven with over 35 years of scientific research at some of the best universities in the world, such as Harvard, MIT and Oxford. In her talk she investigated how mindfulness can change the brain and the impact it has on the nervous system and implications for decision-making and happiness. She also explored the use of mindfulness to create a culture of compassionate and sustainable leadership and business environments. Students were encouraged to take part in activities that challenged their current way of thinking and explore new ways of implementing mindfulness in everyday life. Lúcia drew on a number of different theories, such as U-Theory, Non-Violent Communication, Positive Psychology and the most up-to-date neuroscience findings to discuss highly inspiring concepts of mindfulness. Chathura Athuluwage, a student who attended the talk commented: "The session was very eye-opening as Lúcia taught us about thinking patterns of our mind and how to look at things more openly. I think I will make good use of the concepts I have learnt in the session especially when completing demanding tasks. I’ve learnt techniques which can help reduce stress and enable my mind to be more engaged." Lúcia has experience in teaching mindfulness to a wide audience. She is responsible for training ESPM teachers on the Mindfulness Applied to Education course. She is also working on creating a course tailored for graduate students titled I Am Lab – Innovation, A-Level Learning and Mindfulness. Alongside her many teaching responsibilities, Lúcia is an author of meditation books which have been published by one of Brazil’s most established publishing houses, Grupo Companhia das Letras. Lúcia is also a member of Rede de Mulheres Líderes pela Sustentabilidade (Brazilian Women Leaders for Sustainability Group), a network of influential women in Brazil that promotes sustainability and the empowerment of women. The event was just one of many delivered by colleagues from partner institutions around the world. Global Responsibility Week is part of Nottingham Business School's commitment to meaningful internationalisation, and introducing staff and students to international partners. It is an excellent opportunity to network and discover future opportunities for research and to study abroad. Please visit our Global Responsibility Week page for more information about how you can get involved.